Download SD formatter with all versions to repair and format corrupted MMC and SD memory cards .SD formatter 4 can reformat your corrupted memory card that can't be formatted .Try it now . SD formatter 4 software has been designed for formatting SD memory cards .SD formatter is a free format tool support repairing corrupted SDHC,SDXC and SD memory cards . SD format tool provides a quick format for your corrupted SD card.There is a protected Area in every SD memory cards so SD formatter software doesn't format it .SD formatter 4 can work with Panasonic Memory cards . SD formatter 4 utility Support formatting SD and SDHC memory cards so please don't format recordable media other than SD/SDHC Memory Cards using SD formatting software.SD format software support many operation systems such as Windows 2000, Windows XP, Windows Vista ,Windows 7 and MAC .SD Memory Card and SDHC Memory Card file systems formatted with generic operating system formatting software do not comply with the SD Memory Card Specification. 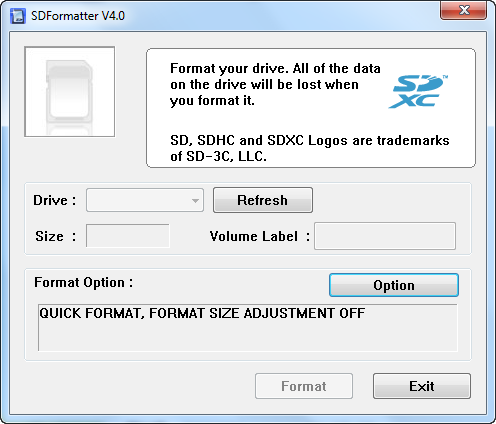 Download SD formatter software .rar from the download links below . Insert corrupted SD memory card to your PC by using Memory card reader . Open SD formatter 4.exe or any software versions . Click Format to begin formatting corrupted memory card . Thanks for this webpage and its links. This solved 2 problems. 1. Windows or my phone was not able to format micro sd card and this utility worked like a charm. 2. Many places where you could download this utility were not working and required you to download proprietary software for download etc. This page had so many links that one finally worked.